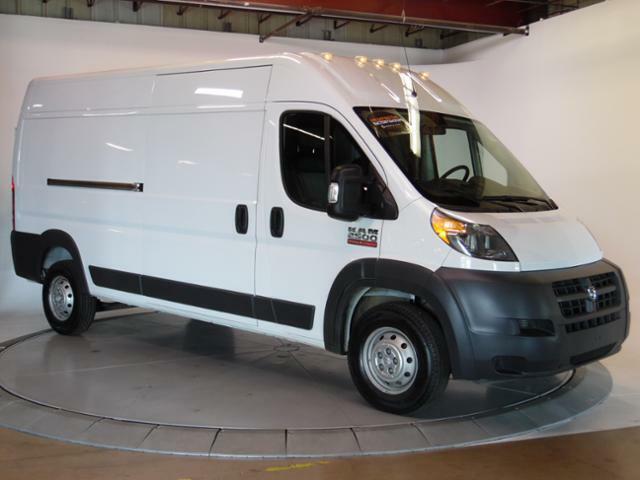 Promaster 2500 High Roof 159 WB, 2500 High Roof 159 WB, Ram Certified, CARFAX 1-Owner. Bright White Clearcoat exterior, ProMaster Cargo Van trim. QUICK ORDER PACKAGE 21A, iPod/MP3 Input, TRANSMISSION: 6-SPEED AUTOMATIC 62TE, ENGINE: 3.6L V6 24V VVT. READ MORE! KEY FEATURES INCLUDE iPod/MP3 Input MP3 Player, Third Passenger Door, Keyless Entry, Electronic Stability Control, Bucket Seats. OPTION PACKAGES QUICK ORDER PACKAGE 21A Engine: 3.6L V6 24V VVT, Transmission: 6-Speed Automatic 62TE, ENGINE: 3.6L V6 24V VVT (STD), TRANSMISSION: 6-SPEED AUTOMATIC 62TE (STD). SHOP WITH CONFIDENCE 7-Year/100,000-Mile Powertrain Limited Warranty, 24-Hour Towing and Roadside Assistance, CARFAX Vehicle History Report, 125-point inspection and reconditioning BUY FROM AN AWARD WINNING DEALER We treat you like one of the family. Jim Shorkey Auto Group started back in 1974 as a small 3-car showroom and has now become one of the most recognized automotive names in Pittsburgh, North Huntingdon, Monroeville, and Western PA. We stock more, sell em for less, and treat you better than anyone else around! Please confirm the accuracy of the included equipment by calling us prior to purchase., Front Wheel Drive,Power Windows,Bucket Seats,Keyless Entry,Power Steering,Trip Computer,Power Door Locks,Third Passenger Door,AM/FM Stereo,Cloth Seats,Brake Assist,iPod/MP3 Input,Steel Wheels,Vehicle Anti-Theft System,Driver Air Bag,Passenger Air Bag,A/C,MP3 Player,Electronic Stability Control,Integrated Turn Signal Mirrors,Side Head Air Bag,Auto Transmission w/Manual Mode,4-Wheel ABS,Tire Pressure Monitoring System,Tires - Front All-Season,V6 Cylinder Engine,Gasoline Fuel,Adjustable Steering Wheel,6-Speed A/T,Full Size Spare Tire,Tires - Rear All-Season,Variable Speed Intermittent Wipers,4-Wheel Disc Brakes Ram Certified, CARFAX 1-Owner. Bright White Clearcoat exterior, ProMaster Cargo Van trim. QUICK ORDER PACKAGE 21A, iPod/MP3 Input, TRANSMISSION: 6-SPEED AUTOMATIC 62TE, ENGINE: 3.6L V6 24V VVT. READ MORE! KEY FEATURES INCLUDE iPod/MP3 Input MP3 Player, Third Passenger Door, Keyless Entry, Electronic Stability Control, Bucket Seats. OPTION PACKAGES QUICK ORDER PACKAGE 21A Engine: 3.6L V6 24V VVT, Transmission: 6-Speed Automatic 62TE, ENGINE: 3.6L V6 24V VVT (STD), TRANSMISSION: 6-SPEED AUTOMATIC 62TE (STD). SHOP WITH CONFIDENCE 7-Year/100,000-Mile Powertrain Limited Warranty, 24-Hour Towing and Roadside Assistance, CARFAX Vehicle History Report, 125-point inspection and reconditioning BUY FROM AN AWARD WINNING DEALER We treat you like one of the family. Jim Shorkey Auto Group started back in 1974 as a small 3-car showroom and has now become one of the most recognized automotive names in Pittsburgh, North Huntingdon, Monroeville, and Western PA. We stock more, sell em for less, and treat you better than anyone else around! Please confirm the accuracy of the included equipment by calling us prior to purchase.